Who says you need to make a trip to the country to see agriculture in action? BBG Herb Garden curator Caleb Leech just harvested a passel of potatoes this morning for donation to a local food pantry. 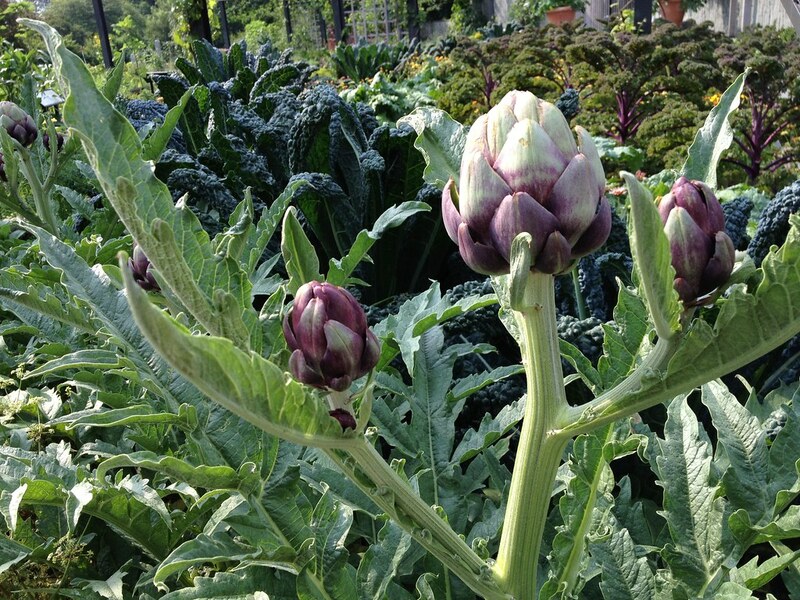 The Herb Garden’s artichokes (above) are also ready to pick, and cardoons (a close relative) will soon follow. Cranberries and blueberries are ripe, too, as the birds that are eating them can attest to. This summer’s hot weather also portends a good year for the warm weather crops like peppers, tomatoes and corn, though this year, Leech has planted a Peruvian variety of purple corn which does well in cooler weather, too. It’s traditionally used to make fermented drink called chicha marada and frequently grows as high as 14 feet. Be sure to visit the Herb Garden now and throughout the summer to see the bounty for yourself. Try these recipes for cardoons. Artichokes I know how to prepare. But how does one prepare a cardoon? Cynara scolymus 'Tempo' (artichoke) in BBG's Herb Garden. Photo by Caleb Leech.